One universal truth about consumer electronics is that they never have enough battery life. Instead, gadget makers opt for thinner and lighter designs, and battery is the first thing to go in pursuit that extra curb appeal. Smartwatches might be the rare case where this isn’t a misguided strategy. Short of some quantum leap in battery chemistry, smartwatches will never rival the years-long battery cycle of a real watch, so you might as well get in the habit of charging them every day or two. In the meantime, any improvements in battery efficiency should go toward making devices that are more fashionable, and less bulky. Pebble seems to have realized all of this with its Pebble Time Round smartwatch. Breaking tradition with every Pebble watch yet, the Time Round makes no effort to achieve week-long battery life. Instead, it lasts a couple days, tops, but is slim enough to make people believe you’re not wearing a smartwatch at all. This trade-off goes a long way toward covering up Pebble’s biggest underlying problems. The Pebble Time Round is much slimmer than your average smartwatch. And yet, no one seemed to mind much as I showed the Pebble Time Round to friends and family. There’s no way to measure this, but a surprising number of people asked about the watch with genuine interest, and marveled at how they could see themselves wearing one. Maybe that’s damning with faint praise, but it immediately made me wonder what those people really thought about all the other smartwatches I’ve sampled. The Pebble Time Round’s appeal owes largely to its color e-paper display, which remains on at all times. Combined with a low-power processor, the Time Round can survive on a much smaller battery than watches with OLED and LCD screens. As such, it’s 33 percent thinner than an Apple Watch, making it feel more at home on smaller wrists. Pebble even offers a choice of 20 mm or 14 mm bands, the latter of which might look a bit silly on a chunkier timepiece. Pebble Time Round, flanked by the 42mm Apple Watch Sport (right) and Pebble Time Steel (left). But this display does have a major downside: Like the square-shaped Pebble Time and Pebble Time Steel, it’s too dim to be legible unless you catch it in just the right light. You can invoke a backlight by shaking your wrist or tapping a button, but that defeats the purpose of having the always-on screen. 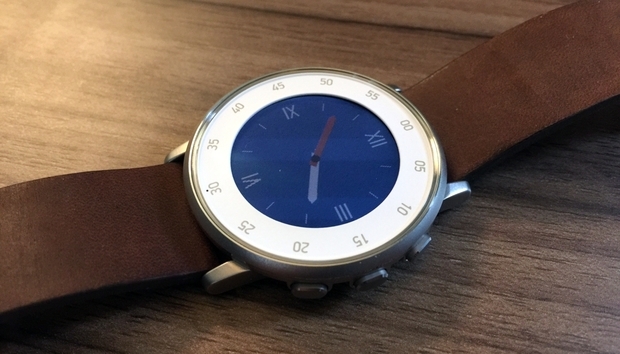 The Pebble Time Round supposed to act like a real watch, but often falls short. The Time Round makes a couple other minor trade-offs compared to other Pebbles. The battery only lasts a couple days, but that’s at least enough to support sleep tracking, and 15-minutes on the charger is enough to last until bedtime. The watch isn’t waterproof like its predecessors, but should survive the occasional splash. Like its square siblings, the Pebble Time Round can display notifications from a phone paired over Bluetooth, and supports step counting and sleep tracking through apps such as Misfit. It runs some basic third-party apps, which you control with a set of push buttons, or in some cases with voice controls. There's also a feature called Timeline that lets you scroll through past or upcoming information, such as sports scores, calendar appointments, or missed calls. Pebble isn’t trying to change the world with its smarts--and that's not necessarily a bad thing--but it’s still disappointing to see how little progress the platform has made with app support. You won’t find official apps for Slack or Wunderlist, to name a couple examples, and I'm still dreaming of a way to track fantasy football scores. Timeline remains underutilized as well, with roughly a couple dozen apps that support the feature. We've also yet to see any Smartstraps, third-party bands that connect to the Pebble's charging port to add new functionality. The fact that Pebble is an underdog in an unproven market is really starting to show. The Pebble Time Round's rear port is just for charging, as Smartstraps have not yet hit the market. One could even argue that the Pebble Time Round has made the app situation worse, as developers must accommodate two types of displays now. Many developers haven’t bothered to support the round version, including big-name partners like ESPN and Jawbone. Bifurcating a platform that’s already short on developer support is a questionable move at best, and down the road, Pebble might need to make some tough decisions about where app makers should focus their efforts. Pebble’s other nagging issue is that it doesn’t work as well with an iPhone as it does with Android handsets. iPhone users can view and dismiss notifications, and trigger voice commands on supported apps. But notifications are non-actionable, which means no deleting e-mails, liking Facebook posts, or replying to WhatsApp messages by voice. An experimental feature allows AT&T users to answer text messages with voice or canned replies, and it worked well in my experience, though there’s no word on when other carriers might be supported. By comparison, Android users get all the same actions that appear in their phone’s notification tray. So instead of just getting a glance at notifications, you can decide how to deal with them straight from the wrist.Pebble CEO Eric Migicovsky told me the company’s working on a solution for iPhone users, though this has yet to materialize. As it stands, Pebble is not a bad smartwatch with an iPhone, but it’s a much better smartwatch with an Android phone. Pebble Time Round: Different sizes, different colors. But here's the thing: Every smartwatch right now has its own deep flaws. The Apple Watch tries to do too much, and at a starting price of $350 for the Sport version, it's much more expensive than the leather-and-steel-clad Pebble Time Round. Android Wear has yet to offer a watch that looks great on smaller wrists, and Samsung's Gear S2 is sorely lacking in apps and wrist band options. In previous iterations, Pebble tried to stand out on battery life and its always-on display, but that alone wasn't enough. The Pebble Time Round instead acknowledges that curb appeal wins, and puts all of its inherent strengths into offering as much as possible. The result is a timepiece that people might actually want to wear.